When people ask me, “What do you do?” I sometimes struggle to explain it in layman’s terms. My initial response is normally along the lines of “I work for a manufacturer that makes conveying and packaging equipment for bulk material handling.” This is about as basic as I can make it without getting into specific details. Typically I get an “Oh….okay.” If not, I will explain that I work with equipment that fills bags of concrete or conveys coffee to the equipment that packages it. If you are at all familiar with the term “Bulk Material Handling” you are probably involved in process manufacturing or graduated from the Bulk Solids Engineering Program at Kansas State University. Regardless of your point of knowledge, Magnum Systems can provide you with the equipment you need. We have provided thousands of installations across the nation for the last 6 decades. The phrase ‘bulk material handling’ typically involves the engineering, designing, and manufacturing of equipment that handles and processes bulk materials. It is the method by which bulk powders, granules, flakes, pellets, major and minor ingredients are stored, transferred, and packaged in various containers. What industries require bulk material handling equipment? Bulk material handling is crucial to all industries that handle various bulk products. Some of the process industries include agriculture, food, beverage, animal feed, pet food, tobacco, chemical, polymer, plastics, rubber, compounds, ceramic, mining, asphalt, mineral, coatings, paint, paper, and metals. Each of these industries and many others use dry bulk materials to manufacture their products. Product characteristics dictate how you handle it. Dry bulk materials are supplied from multiple vendors across the globe. As a result, the product characteristics of the same material can vary from supplier to supplier. So it is very important to know what the flow characteristics of your product are. Bulk Density: Typically measured in lbs. / Ft.³ this is often confused with Specific Gravity. Particle Size: An example would be 30 mesh or 600 microns. Temperature: Is the temperature ambient? Form: Is the form granular, powder, pellet, flake, chip, fiber, irregular, stringy or other? Angle of Repose: The angle of repose the steepest angle of descent or dip relative to the horizontal plane to which a material can be piled without slumping. Material Characteristics: Aerates, fluidizes, packs, compacts, compacts with pressure or vibration, heat sensitive, fragile, dusty, abrasive, hazardous, toxic, corrosive, explosive, flammable, cohesive, how does moisture effect it, etc. Flow Characteristics: Possible arching, bridging or rat-holing of the material in a hopper, feeder, or silo discharge. These material characteristics will play an important role in how you can successfully transfer, convey, fill, meter, or mix the product utilizing bulk material handling equipment. Bulk storage and bulk unloading. Processing plants store their materials in bulk then transport and unload them at various points in their process. The equipment needed to handle bulk sacks, totes, or RIBC’s, then discharge it is typically referred to as bulk unloading or bulk bag unloading. One of the biggest factors plant managers/engineers have to consider is the amount of space they have available in which to fit the unloading equipment. Most equipment manufacturers will need about 16’ to be able to fit their bulk bag frame in your facility. With that in mind, there are always custom options. Some applications may require that you mount a hoist to the ceiling and have the bottom half of the bulk bag system framework fit into your unloading area. For more information on Bulk bag unloading see the video on the Dos and Don’ts of Bulk Bag Unloading. Transfer options for material unloading. You can get a bulk bag unload station from just about anyone these days but you’ll want to make sure that they not only provide the equipment to unload your bulk materials but also a means of transferring it to the next point of your process. Depending on your application and material characteristics this can be done in multiple fashions. If you have less than 50’ then the mechanical conveying method is a great choice. A Flex conveyor, belt conveyor, drag conveyor or puck conveyor, U-Trough conveyor, screw feeder and/or a vibratory feeder are available options. Additionally, if transferring your product more than 50’ and less than 500’ then pneumatic conveying will most likely be your best option. We dig deeper into pneumatic conveying options in a previous blog “Pneumatic Conveying Unload Options from Bulk Bags”, but typically you will see the vacuum conveying option as the most popular choice. Although we manufacture our own pneumatic conveying systems we also provide mechanical means of metering and conveying equipment. Packaging your material in bulk. If you provide your product in bulk to your customers then you will need bulk filling equipment at the end of your process. The advantage of using automated bulk filling equipment is increased efficiency, safety, and dust containment within the filling process. Additionally, Magnum equipment can be customized to handle bags, boxes, drums, totes, and other FIBC/RIBC containers. 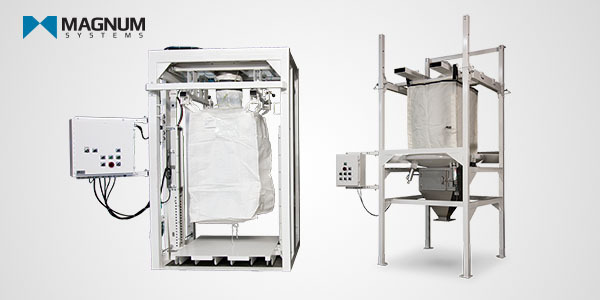 Our bulk bag filling stations provide an accurate, easy to operate system that provides a positive ROI. Other bulk material handling equipment includes storage silo’s, work bins, mixers and ribbon blenders, large and small bag, bagging systems, robotic palletizing, check-weighing, conveying equipment for bags, and industrial automated controls packages. Magnum Systems engineers, designs, and manufactures pneumatic conveying and automated packaging systems to keep your line moving from rail or truck to pallet, and everywhere in between.